Before the bunnies are auctioned, they are being displayed around the beautiful, historical city of York. There are 26 bunnies in total, hiding in shop windows, just waiting to be discovered! To embark on the trail, visit York's Visitor Information Centre and pick up a map. We won’t reveal which window our bunny is hiding in yet. After all, that would spoil the surprise! Each bunny began plain, before various artists were invited to bring them to life. We decided to create a design which was fun and unexpected. We always aim to adopt a playful approach with all we do, so “punk” became our theme. 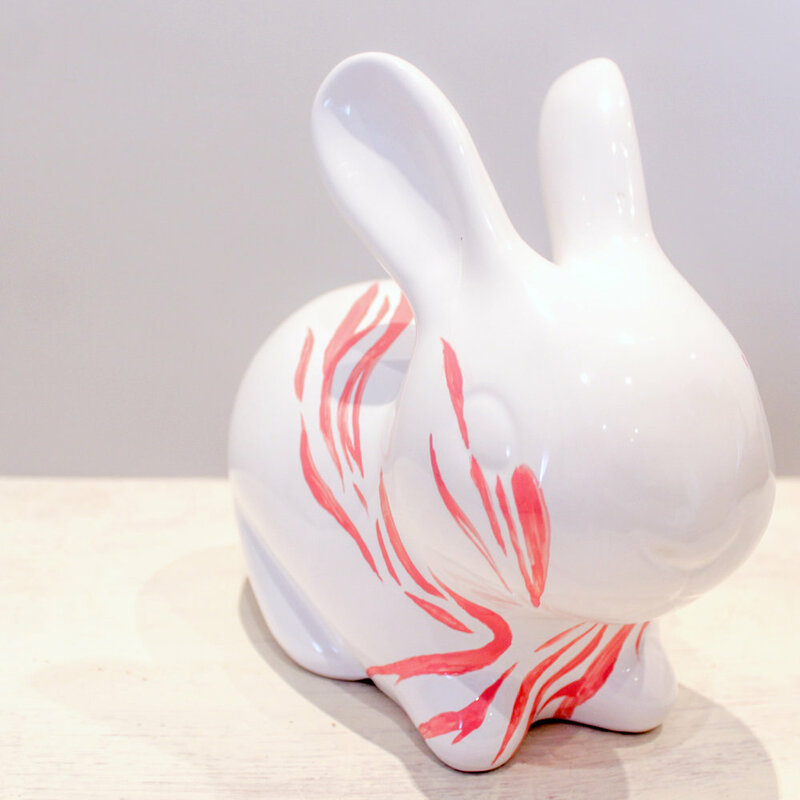 We brought our ceramic bunny to life by using enamel paint. We adopted a minimal colour scheme to create a design which was striking, yet fit stylishly into someone’s home. To add a touch of humour, we added phrases such as “if you can’t say something nice, don’t say nothing at all”. This was inspired by Bambi’s iconic character: Thumper. The colour pink adds a softness, which reflects the Buttercrumble brand. We wanted to strike a balance between “rebellious punk” and “playful fun”. Moreover, it was created at the Happiness Atelier! We hope you love the illustration as much as we enjoyed creating it. The Great York Bunny Search takes place from the 2nd April - 23rd April 2019. To find out more about the trail, take a look at the Visit York website. If you’d like to be informed about the charity auction, click here! Finally, we want to deliver a huge thank you to Snowhome for providing this opportunity to us.